Cologne - With four games to spare, FC Bayern München's 1-0 home win against Hertha Berlin on Saturday, coupled with second-place VfL Wolfsburg's defeat at Borussia Mönchengladbach a day later, put the record champions' 25th German title beyond any remaining mathematical doubt. 24 of those have been earned in the post-1963 Bundesliga era and, remarkably, has been on board for the eight most recent. The 30-year-old Bayern vice-captain thus joins an exclusive club of eight-time winners which until now consisted only of legendary Bayern duo Oliver Kahn and Mehmet Scholl. 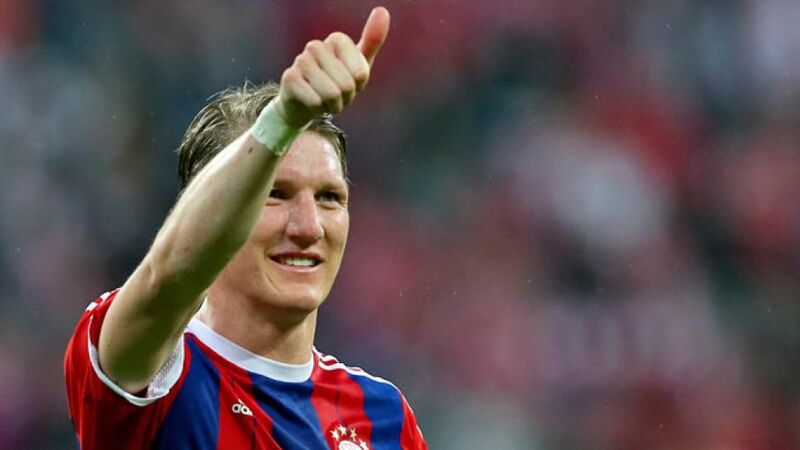 Schweinsteiger, moreover, has seven DFB Cup victories under his belt, one more than goalkeeping great Kahn. With 15 major domestic titles to his name, he is now German football's outright record-holder in the silverware stakes. How appropriate, then, that it was Schweinsteiger who bagged the only goal of the contest against Hertha – a crisp 80th-minute finish into the top corner following a mazy run down the flank by youngster . The moment inevitably rekindled memories, as well, of the midfielder's exquisite back-heeled strike against Eintracht Frankfurt that sealed the deal on another ahead-of-schedule title success in 2013. The two years since have been abundantly fruitful even by Schweinsteiger's prolific standards. Within weeks of that victory over Frankfurt, Bayern had wrapped up an unprecedented treble of Bundesliga, UEFA Champions League and DFB Cup. By the end of the calendar year, they were UEFA Supercup and FIFA Club World Cup winners as well, claiming the latter title midway through another league and cup double-winning campaign. And then came the small matter of Germany's triumphant march to victory at last summer's World Cup in Brazil, with a battered, bruised and bandage-swathed Schweinsteiger providing one of the final's most iconic images. Now, back on the domestic stage, he and his clubmates can travel to in-form Bayer 04 Leverkusen this weekend in a duly relaxed frame of mind, having put the official seal on Bayern's fourth all-time hattrick of consecutive Bundesliga titles. Not too relaxed, however, in light of the game that follows on from that next Wednesday – against FC Barcelona, at the Camp Nou, head coach Pep Guardiola's alma mater, on UEFA Champions League semi-final business. Schweinsteiger, a one-club player all his professional life, has a year left to run on his current contract. One thing can be said with certainty at this moment in time: 14 years down the line from his first title with FC Bayern, the 2001 German U-17 championship, he has no intention of this record eighth Bundesliga triumph marking the end of his unparalleled Munich trophy trail.